General Motors and Chinese light-duty commercial vehicle partner FAW — the country’s first automobile manufacturer when it unveiled the nation’s first domestically produced passenger car in the late 1950’s — have unveiled the Kuncheng small pickup truck during the Changchun International Automobile Fair in Changchun, Jilin, China and it leaves the impression of being… basic. While it’s not an all-new Chevrolet Colorado, there is nothing wrong with a no-frills compact truck in a growing market like China, and the Kuncheng (or “Earth’s Journey”) fits the bill just fine. The truck will offer both gas and diesel variants, with both coming in 2.2 and 2.4-liter varieties. 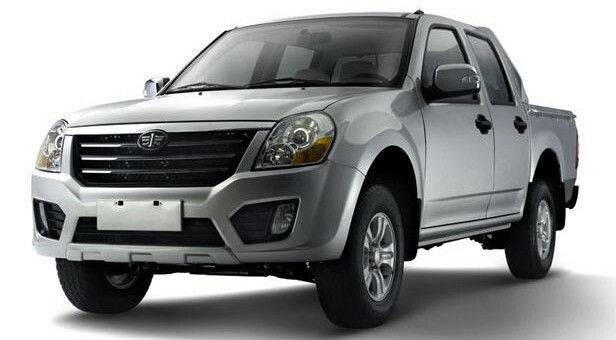 As far as safety features go, the Kuncheng sports a “front impact-absorbing structure and four-door impact steel beams (to) help minimize damage in the event of a collision. Among the other safety features are three-point seat belts in front, a collapsible steering column, child-proof doors in back and a center high-mounted stop lamp.” Because who needs air bags, right? Nothing wrong with basic transportation, I have seen other posts on other sites stating how hideous this truck is, to me it looks fine.